My grandma, Moms, has been baking out of this 1961 Betty Crocker cookbook for as long as I can remember. Her copy of the book is on the right. And as you can see it is in bad shape. It has been though a lot of buttered fingers and sugar coated spoons. I surprised Moms with the ‘newer’ copy of her favorite cookbook the other day. You should have seen the smile on her face. 🙂 Just be prepared for some good recipes coming your way from this beauty of a book. Thank you Betty Crocker. You ‘rock’. What a special gift! So sweet of you! this is so sweet! i think you might be the best granddaughter on the planet. 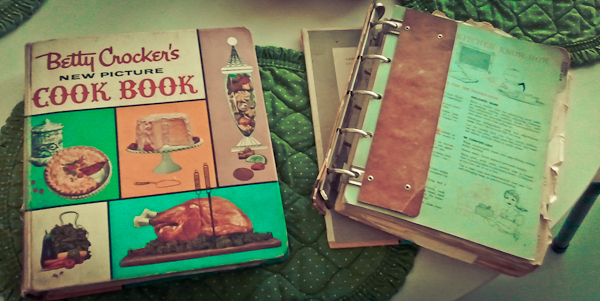 =) i have some cookbooks + knitting books that were passed down from my grandmother + they are so neat. we also treasure the handwritten recipe cards that my grandma wrote in the 1930s + 1940s. my mom + i consider them the best family ‘heirloom’ ever. And what a surprise it was! I had no idea you were still searching for that 1961 edition for me but I love it that you “so secretly” kept up the search. That cookbook is a classic and belongs in every kitchen……so many of our favorites, cookies, cakes, coffee cakes, icings, there’s no end! It should be in reprint! My grandma has the exact. same. cookbook. When she got sick last year on the morning of Thanksgiving I stepped up to the plate and finished her already-started Thanksgiving dinner (she insisted that it be finished with or without her) with the help of that cookbook (and a few recipes that had been clipped to its pages). Love it!